Co-sponsored locally by the Crossroads Collective, Buffalo residents and visitors join thousands of rallies held in cities and towns around the world to demand our local leaders commit to building a fossil free world that works for all of us. 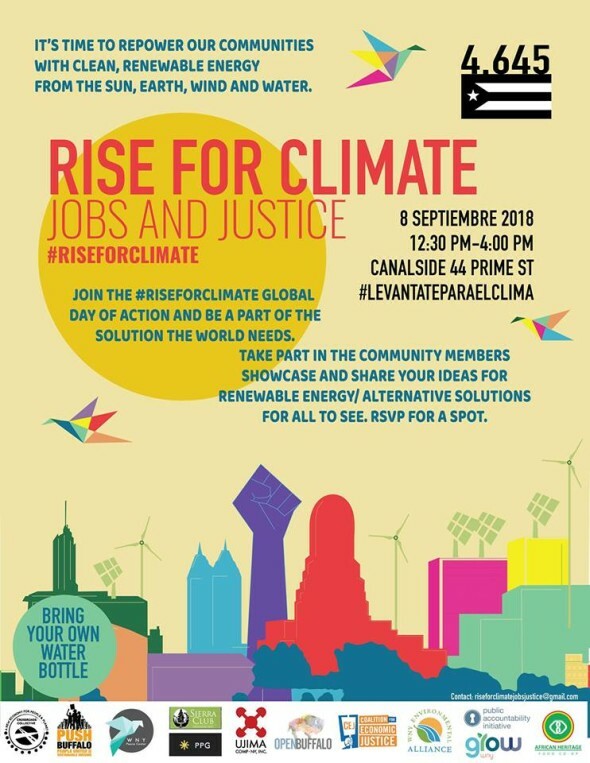 Deemed climate leaders will be convening in San Francisco Sept. 12-14 for the Global Climate Summit, thus we will rise before that to let them know how serious we, the people, take our planet and our lives. We will rise for our livelihoods, and our communities. WE RISE for the end of discrimination and degradation in our environment, and the birth of just communities, jobs, and quality of life! We will come together at Canalside to build actual people power around the reality of our stories and experiences. We will also be commemorating all the victims of Puerto Rico as we approach the 1 year anniversary of Hurricane Maria… 1 year later and still, our brothers and sisters are left to survive on their own. There will be a rally, stations of local orgs tackling climate injustice, food, local music performances, as well as cultural art visuals. Participants are welcomed to bring any renewable energy creation they’d like to showcase for a collective video of what the community wants, needs, and how we’re already practicing a more just transition into the future. WE KNOW WHAT WE NEED IN OUR COMMUNITY, so be part of creating the solutions as we continue identifying the problems! Join us as we hold our local leaders accountable and demand that they walk the talk on climate action.